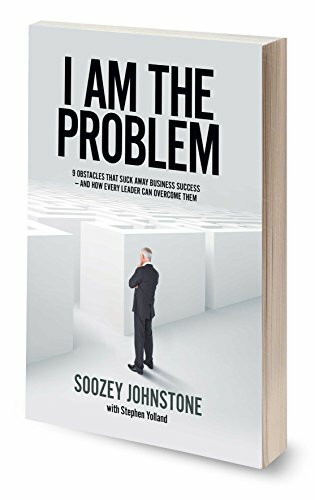 To check that you are not the problem’, Soozey Johnstone, author of I AM THE PROBLEM provides a resource which is your personal and business health check. She’s identified nine obstacles to the health of your success which you can diagnose with your leadership team/or by yourself. You can’t be expected to know everything; like your health, there is always something niggling or you might have a health issue which you consult experts to support you. However, too often you believe you know best, self-diagnose and self-manage learning making the health issue worse. Are you the obstacle of success which your business deserves? With years of practical experience, a truckload of professional development reading under her belt, this great resource has been brewing in her head for 20 years before the words were put to paper – Soozey is keen to share what she’s learnt from her business and client experiences. I know I found myself scribbling questions, answers and ideas - I was really confronted with some questions I hadn’t considered. For example, “What do you hate?” Like, “what would you answer? To be clear, this question is helping you quickly identify your vision – to get it crystal clear. Fred Hollows hated people being blind because they couldn’t afford a $5 operation. 1. Self-Awareness – how aware are you of your behaviour and your thoughts? What feedback have you sought from your team and how much time do you commit to writing in your Journal? Dr Carol Dweck advises that we need to have a growth mindset – one which is positive, optimistic, less judgemental and less defensive. What mindset do you have? 2. Strategy – the key is Clarity. How clear are you and everyone in your business about the strategy? Jim Collins recommends that we all need a BHAG or a SHAG! A Big Hairy Arduous Goal which is the focal goal of the business and the catalyst for team spirit. The SHAG is a smaller version! 3. Execution – pick a general direction and execute like hell! 4. Culture – Who are we together? Pro-actively choosing to influence your culture in alignment with your core values and vision can ignite a workforce if it’s done right. Culture happens. Whether you plan it or note. And culture affects your bottom line. 5. Energy & Mindset – think about the impact of what you’re thinking about. 6. Self-Management – wear different hats at different times of the day i.e. block your time and focus your best self on that block and ‘work all the time you work’. And get fit, walk, laugh, sleep and eat your veggies. 7. Communication – think before you speak! If we all took heed of this advice we’d all be in a better position. Present well, consider the learning styles of the recipients of your messages and use your ears more than your mouth. 8. Behaviour – leaders who adapt their behaviour increase their achievement of better productive relationships. And those that know their ‘why’ (think Simon Sinek) and their motivations have better behaviour choices. My favourite statement in Soozey’s book is ‘get things half right’ If you meet half way and your team does the same, then you’ll have a whole team approach. To build the bridges for the many potential chasms in your business, you need to reflect, think, plan and communication with fellow leaders. Be mindful that we all don’t have the answers however they are likely to be in the room and definitely in the organisation. There are several case studies incorporated into the book which read well and help bring the lessons to life. I’d say most workplaces are represented enabling you to make sense of the context. Thanks Cynthia Mahoney for generously giving me this book, to read and keep. And no doubt, we’ll use some of these gems in our client workshops and meetings.